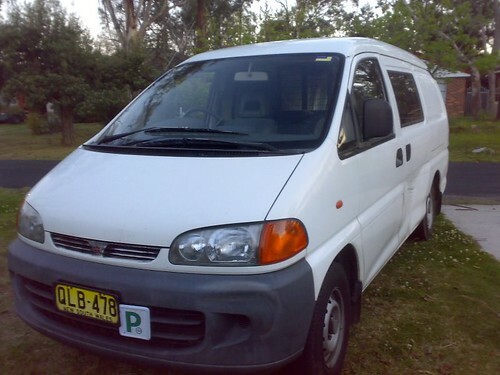 FS: 95 Mitsubishi van/trade with a ute. Thread: FS: 95 Mitsubishi van/trade with a ute. I'm looking to get rid of my van, Here she is. Some cosmetic damage, drivers side door and passenger sliding door are pretty damaged. This is a good van, I just need something more suitable for towing. I have towed my hachi with it, it managed but its not something i would want to do regularly. I'm looking for 3800 as is, was quoted about 800 for new doors, but its mechanically fine. Last edited by Mickey H; 2nd January 2009 at 07:50 PM. Bump, should of put this in the for sale section, could a mod please move it. I'll be happy with 3500, just need something smaller for a daily. Very reliable, never had any problems. Only done 240,000km which isnt mught for one of these, redbook value is about 5k its just cheap because of the poor cosmetic damage. I have a 92 Mitsubishi Triton rego till 23/4/09 manual aircon and power steer.